On January 25th there will early elections in Greece, elections which are being followed with huge expectations throughout all of Europe. These elections have emerged as a product of the profound political, economic and social crises that have shaken Greece to its foundations for more than 6 years, placing it at the center of the hurricane of the capitalist crisis. The economic crisis has amplified tensions with the imperialist bloc of the European Union, which is divided between the countries in Germany´s orbit and the peripheral countries that are more deeply affected by the crisis. In recent years there have been distinct forms of struggle and resistance against the austerity plans imposed by the Troika (EU, IMF and European Central Bank). These plans aim to save the European capitalists at the expense of the living conditions of most workers and young people. The social and political crisis and the crisis of the traditional parties, from the conservatives to the Social Democrats, has in the last few years, strengthened parties of the extreme right and new formations to the left of Social Democratic parties. The parties of the extreme right have grown with the xenophobic, anti immigrant and nationalist rhetoric, such as that of the National Front in France. We also see new parties to the left of social democratic parties like Podemos in Spain and Syriza in Greece. The brutal attacks against the headquarters of Charlie Hebdo magazine and against a Jewish supermarket have exacerbated xenophobic and Islamophobic tendencies – which had already expressed themselves in the growth of the extreme right parties and movements. The European governments, François Hollande of France in particular, saw the attacks as an opportunity to recover lost ground and have launched repressive operations in most of the European countries, making immigrants targets of those attacks. 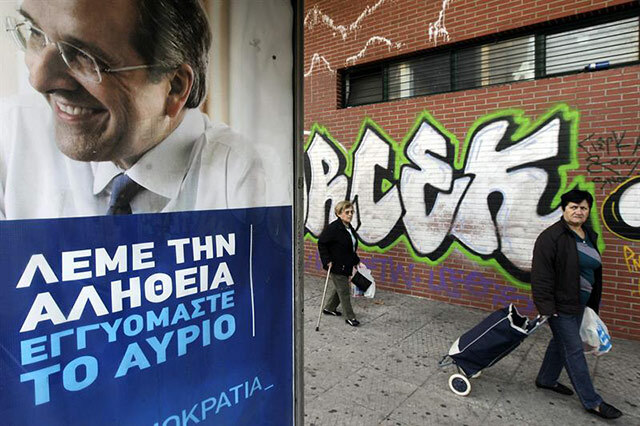 In Greece, the government of Antonis Samaras was forced to call early elections after three failed attempts to make the Parliament vote for his candidate for the Presidency of the country. The governmental coalition of the conservative New Democracy and the Greek socialists of PASOK did not receive sufficient votes, demonstrating the crisis of the parties which historically were pillars of Greek bipartisanship since the end of the dictatorship in 1974. All polls point to Alexis Tsipraras, of Syriza, as the likely winner of the election on the 25th of January. The latest polls reaffirm Syriza’s lead over New Democracy, the strongest party in the coalition, although Syriza’s victory is not guaranteed and even if it does win it is possible that it will need to join with other political parties in order to form a government. In the last few years there have been massive mobilizations by workers, students and the poor, including 32 general strikes since 2010, mass mobilizations, partial strikes, ‘kettling’ and clashes with the repressive forces of the state. The profound popular discontent has accelerated the crisis in the Greek political system, although it has not been enough to topple the austerity governments that have applied the Troika’s plans. It is in this context that Syriza emerged as an important political force in Greece. Today, the possibility of a Syriza government has generated huge expectations among millions of workers and the masses, who see it as a chance to put an end to the austerity plans and undo the effects of the profound social crisis. Syriza has spread illusions not only in Greece but also in all of Europe. The increasing possibility of a Syriza government has created tremendous political uncertainty among the markets. The IMF and the Troika postponed giving out the fifth tranche of the rescue plan until the new government is formed- a clear attempt at blackmail. Uncertainty has grown, even though the leaders of Syriza maintain that they do not have a plan of breaking with the EU and instead propose a moderate restructuring and negotiation of the debt with their creditors. The conservative Spanish President, Mariano Rajoy, traveled to Greece to give his support to Samaras, the current Prime Minister of Greece, because what he is most afraid of is that Syriza’s victory will produce a contagious effect that will end up burying the Popular Party and strengthen Podemos in the elections. Because of this, even when Syriza has tried to show itself as a “responsible” party, the campaign of fear from the European leaders and the financial markets did not take long to begin. The declarations by the German financial minister, Wolfgang Schäuble, reaffirming that “there is no alternative to structural readjustments” were echoed by the director of the IMF, the European Deputy of Economy, Finance and Commerce, Pierre Moscovici and the President of France who warned that the Greek government must “fulfill its commitments”. In the face of these threats, provocations and blackmail by the imperialists and the Greek bourgeoisie, we unconditionally defend the right of workers and the Greek people to vote freely for whomever they prefer and to defend the result of the election by any means necessary, should the right and the “markets” attempt to prevent a Syriza government. Having said that, we understand that for millions of workers and young people, voting for Syria represents a vote to stop austerity measures. Yet, we do not think that Syriza represents a way out for workers and the Greek masses, and Syriza does not have the goal of building mass anticapitalist mobilizations. For these reasons, we cannot give our political support to Syriza. Syriza’s intention is to revive a kind of Social Democratic Keynesianism, which in a political and economic context of neoliberal consensus can seem “radical”. Yet, its program is based on negotiating with creditors for a partial restructuring or a moratorium on the debt, printing money and a new short-term debt. Their latest declarations have become more vague and slippery as to their objectives. They have declared that they would use some state investment to ensure minimal services such as sanitation to the poorest sector and reconnect electricity to the homes where it was cut off due to a lack of payment. They also promise moderate fiscal reform and the reestablishment of the minimum wage of 750 euros, at the level it was at before the austerity measures of the Memorandum. At the same time, the leaders and economists of Syriza have insisted that their intention is not to “break with the EU”, nor is it to declare unilateral non-payment of the debt. All signs point towards conciliation, like Tsipras’ presentations in London and to the Orthodox Church to ask for support. 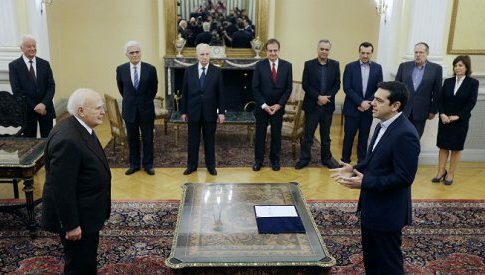 Syriza has also incorporated ex members of PASOK to Syriza and even a controversial member of Parliament, Rachel Makri, who entered through a right wing party, the Independent Greeks. The strategy used by Syriza is to limit their program to a few “acceptable” proposals to the governments of the EU and the financial markets and in that way to achieve a compromise that will allow for political stability and the recovery of the Greek economy. Apart from some informal statements made by some functionaries and Brussels bureaucrats who said that they will have to negotiate with the next Greek government, while imposing the conditions on those negotiations the EU and IMF have not made any commitments other than to continuing the plundering of Greek workers and the Greek people. A few have issued informal statements in which the state that they will negotiate with the next Greek government, while imposing the conditions on those negotiations. Much of this could be a hard line posturing to strengthen their bargaining position in negotiations to win more concessions from Tsipras. They will threaten Syriza with the prospect of a disorganized exit from the Euro and the possible collapse of the Greek economy. Syriza is not even going so far as to threaten to withhold debt payments, threats which were made by many Latin American governments in the 80’s who later retreated from their position and paid the debt after a moratorium or a negotiation with the “debtors clubs”. Syriza is likely to retreat to a reformed austerity program. Even an “accident”, like Greece’s withdraw form the Euro, won’t mean in anything good to the masse sof Greek people to the extent to which Syriza refuses to put into question the economic power of the large Greek capitalists and the links which tie them to European and international capitalism. Syriza’s politics of class conciliation are an obstacle to resolving the most urgent needs of workers and unemployed Greeks. Many left wing parties justify their support for Syriza by saying that a Syriza government would spark the struggle of the Greek masses. They argue that the inflexibility of the Troika and the Greek capitalists could lead n to a confrontation that would provoke ruptures and be fruitful for the mobilization of the Greek working class.We cannot exclude any scenario: a very hostile attitude of the Troika towards a Syriza government, some type of “market coup” or offensive on the part of the local bourgeoisie. All of these could provoke a legitimate popular response, despite the conciliatory politics of Syriza. In this case, the task would be to build a united front of workers organizations in order to organize in the streets, in the factories and in the workplaces, as well as in schools and universities, the resistance to the capitalists and respect for the electoral results. But today, another alternative seems more probable – that the Syriza government, almost without any “margin of negotiation” with the Troika, will not be able to implement the promised reforms and more likely will implement a few minimal measures at first and will later impose a new model of austerity. In any case, Syriza will neutralize the power of the working class, making them believe that their demands will be met in the Parliament and not through mass mobilizations. The failure of the Tsipras government or a betrayal of its campaign promises could generate a wave of disillusionment and demoralization throughout the Greek working class. It is in this realm of despair that far-right tendencies could regain strength, including pro fascist’s organizations, like the Golden Dawn, which expects to maintain its parliamentary representation. The problem is that the program of weak reforms and conciliation with imperialism and the Greek Bourgeoisie, defended by Tsipras will set the stage for a massive disappointment for the Greek working class. The mobilization of the masses is not akey point for the leaders of Syriza because it runs contrary to their reformist strategy of maintaining a ’serious’ image to the market and to the Troika. The possibility of a Syriza victory has created great expectations among the currents of the European reformist left, such as Podemos in Spain. This formation is preparing for an election year in which it has emerged as one of the strongest parties. All of the Spanish media is discussing the possibility of a Podemos government, allied to the Izquierda Unida or even with the PSOE. In France, a victory by Syriza and Tsipras could breathe new life to the Front de Gauche which has been in crisis for a few months. However this resurgence of the Front De Gauche could be in a much more rightist form. Last week, Syriza finalized an electoral agreement with the Greek Ecological Party, which while marginal in Greece has ties to Green parties in the European Parliament, which have been part of ruling bourgeois governments that have imposed harsh austerity measures against the masses. This is the case in France for example, where recently the Greens were part of the government with Hollande and where one of the main leaders of the Greens declared their support for Syriza. The strengthening of this class conciliatory ´Left´´is an obstacle for the advance of the working class and the masses towards political independence from the bourgeoisie and imperialism. In Greece there is a space for the left outside of Syriza, which has important presence in mass mobilizations, workers´ struggles and youth/student movements. Besides the many anarchist currents, the most important left party outside of Syriza is the KKE (Greek Communist Party) which has polled about 6.2% in the elections. The KKE is a party with a strong Stalinist tradition and has an important presence in the unions and in the streets. However, its politics combine the tactical sectarianism of refusing to apply the united front alongside the strategic opportunism of putting forward a reformist solution for the crisis- their central proposal is to exit the euro and the European Union with a platform of ´left national sovereignty. ´Their criminal politics allow the leadership of Tsipras to continue its turn to the right with few political costs. The political landscape in Greece also includes other anticapitalist parties. This year, the anticapitalist group, Antarsya, formed an electoral alliance called the United Front of the Radical Left. This includes the’Plan B’ party, led by an ex-leader of Syriza, Alekos Alavanos, who openly defends nationalist positions. Their principal demand is to break with the euro and return to the drachma, the old Greek currency. This would cause a monetary devaluation which is seen by this current as necessary step for the “recovery of the national economy”. Without splitting with this electoral coalition, these politics are opposed by the left wing of Antarsya which is primarily made up of the SEK (the sister organization of the British SWP the main organization within the International Socialist Tendency) and the group OKDE Spartakos (The Greek section of the USFI, which holds a position to the left of the majority in the international). Even if today, given the iron-clad consensus among the bourgeoisie of the EU, this demand may appear ‘radical’ and even to some ‘anti-systemic’, it is not. In fact, an upsurge in the class struggle together with a renewed economic crisis could push an important sector of the bourgeoisie to adopt a nationalist, sovereign alternative. In this way, these ‘left national sovereignty’ policies could find themselves helping some bourgeois or imperialist solution. Syriza is part of a ‘europhile’ left which has the utopian aim of ‘democratizing’ the reactionary institutions of the European Union and negotiating ‘better terms’ within the existing structure; as if it were possible to establish a ‘Social Europe’ under the dictatorship of the big banks and imperialist capital. We reject these reformist politics which seek to ‘democratize’ the reactionary institutions of the European Union. However, also do not accept the options put forward for a sovereign exit, which end up playing along those sectors of the national bourgeoisie that call to ‘exit from the euro’ and have a capitalist economy centered around national production. The alternatives that defend a solution to the crisis following similar measures to those taken in Argentina in 2002 are equally reactionary because they imply a devaluation which will reduce even more the standard of living of the masses. Moreover, they are utopian, because the exceptional conditions of the Argentinian case no longer exist. Argentina, after a brutal cut to workers salaries, was able to pick up wind from the growth of the international economy which helped to restore the economic growth for a certain period, without changing the semicolonial structure of the country. This is showing its limits in face of the new phase of the crisis as it effects emerging economies. Outside of Syriza and Antarsya, small organizations which claim the legacy of Trotskyism and raise a program of class independence also exist. 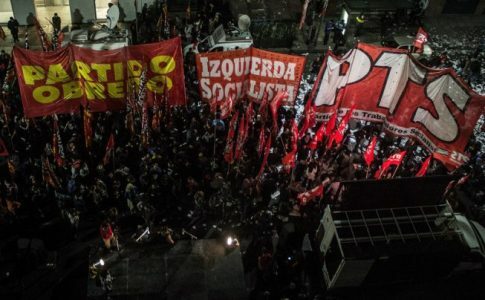 These are the EEK (Revolutionary Workers Party, linked to the CRCI and the Argentinian Partido Obrero) and the OKDE. However in recent years neither of these organizations nor those which form the left wing of Antarsya have been able to present a unified alternative in the elections which could influence significant sectors of workers and youth. Unemployment has reached higher than 27% and affects more the 50% of youth and women while half of the Greek population finds itself under the poverty line. The quality of life of Greek families has fallen 40%, and the public debt represents 175% of the GDP. In this situation of social catastrophe, it is impossible to stop the cuts and increase public spending to benefit healthcare, education, and living standards without stopping debt payments and taking on the Greek capitalists linked to European and international finance capital. It is not possible to end the massive unemployment without repealing the labor reform laws, rebalancing work hours among the employed and unemployed, and raising the minimum wage to a level which supports a family. It is necessary, among other measures, to nationalize without any indemnification and place under the control of workers and consumers the banks and all companies providing essential services, as well as strategic sectors including all factories and businesses which attempt to shut down. These measures necessarily imply a break with all of the conditions, pacts, memorandums and budgetary controls of the reactionary institutions of the European Union and the Troika. This program never will be acceptable for Juncker, Merkel, the IMF and the Greek capitalists: it can only be imposed through a profound and generalized social mobilization, to call to new general strikes, extending, coordinating the efforts, and especially deepening experiences of the self organization of workers and the masses to defeat and overcome the different labor union bureaucracies. The workers, students and popular Greek sectors from the first day of a Syriza victory should be in the streets using direct action to achieve their demands without expecting even the smallest gain from the new government and Parliament. They should call upon the support and solidarity of the workers and poor people of the European countries, especially those of Southern Europe, to defend the workers of Greece. We understand the millions of workers and youth of Greece and Europe who expect that a victory for Syriza can change the course of austerity politics that are provoking a true social massacre throughout the continent. However, we maintain the firm conviction that the only progressive and realistic solution is a revolutionary struggle against Greek Capitalism and the European imperialist powers, through the formation of a workers´ government. The European Union is a reactionary achievement of the banks and monopolies, based on the imperialist exploitation of the people of Africa, Asia and Latin America, as well as immigrants and workers within Europe. In the last few decades, Eastern Europe has been transformed into the backyard of German imperialism. It is necessary to confront the different capitalist projects for the crisis of the European Union. We must struggle against the utopian illusion of democratizing the EU which the reformist left raises, ignoring the reactionary and imperialist character of the EU. We must also struggle against the demagogy of the extreme right which stirs up national hatred with the goal of separating the working class of different countries as well as separating native and immigrant workers within countries to tie some of the working class to a section of the national bourgeoisies. We must also struggle against the false alternative of ‘left patriotism’. The workers need a program independent of all the variants of capitalism. Facing the crisis of European governments and the Europa of the capitalist, in order to overcome the fragmentation of the workers, fight xenophobia, anti-immigrant politics, and to win over the middle class that has been impoverished by the crisis – which otherwise will be base of the far right – it is necessary to put forward the struggle against the governments, the Troika and the imperialist institutions of the EU, on the path towards imposing workers governments which fight for a United Socialist States of Europe. This is the only progressive solution for workers in the entire continent.